died April 17, 2008, at the age of 61, after a long illness. Abdel-Ghaffar’s 1974 investigation of the dynamic characteristics of the Vincent Thomas Bridge in Los Angeles, done when he was a graduate student, led to new standards on how to collect, analyze and interpret structural dynamic measurements from complex, three-dimensional, extended structures. His investigation allowed the development of high-fidelity computational tools used to reliably design such structures to resist the action of earthquake ground motion. The California Department of Transportation (Caltrans) used Abdel-Ghaffar’s computer program when it embarked on a major retrofit of the Vincent Thomas Bridge, and he served as a consultant, determining the damping characteristics of the bridge. "Building tall bridges that span engineering frontiers and withstand great earthquakes was Ahmed Abdel-Ghaffar's passion. Ahmed was a gentleman engineer and a dedicated educator," said Jean-Pierre Bardet, chair of the USC Sonny Astani Department of Civil and Environmental Engineering where Abdel-Ghaffar was on the faculty. Abdel-Ghaffar also made major contributions to understanding and analyzing the behavior of structures interacting with soil during earthquakes. He was among the pioneers who conducted forced-vibration experiments on the Santa Felicia Earth Dam and interpreted its recorded seismic and dynamic response. A meticulous writer with an eye for detail and eloquence, he was a gifted and dedicated teacher whose lecture notes continue to be used today by his students many of whom are professors at academic institutions worldwide. A native of Egypt, Abdel-Ghaffar graduated in 1970 from Cairo University with a B.S. degree in civil engineering. He was the class valedictorian, earning a “first class honors” distinction. After working for two years as an instructor in structural engineering at Cairo University, he attended the California Institute of Technology, where he earned a master’s degree in civil engineering in 1973 and a Ph.D. with an emphasis on structural dynamics and earthquake engineering in 1976. His reputation at Cairo University as one of the most intelligent and attentive young lecturers led other aspiring Egyptian researchers to follow him to the United States. Abdel-Ghaffar’s pioneering research at Caltech as a doctoral student under Prof. George Housner brought him international recognition in the then-emerging field of sensor-based monitoring of long span flexible bridges. 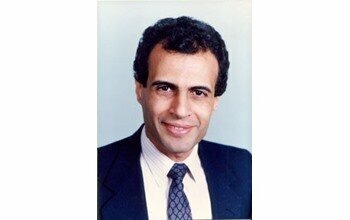 In 1978 Abdel-Ghaffar joined the Materials Engineering Department at the University of Illinois at Chicago-Circle and he moved to the Civil Engineering and Engineering Mechanics Department at Princeton University as an assistant professor the following year. He came to USC in 1987 as a full professor. He served as a consultant to government agencies in the U.S., Japan, Europe, the Middle East, and elsewhere. Among Abdel-Ghaffar’s many notable projects, was one to monitor vibration of the Golden Gate Bridge and he hung a breathtaking photograph in his office showing him and his students standing near the top of the bridge while collecting sensor data. During his long illness, he continued to interact from his bed with a number of international contacts and provide valuable advice on many projects, such as the long span bridge across the Gulf of Suez. Abdel-Ghaffar, a resident of Rolling Hills Estate, was survived by his former wife and three children. Fellow of the British Royal Academy of Engineering Amr Elnashai is the Dean of Engineering at the Pennsylvania State University, and the Harold and Inge Marcus Endowed Chair of Engineering. As dean, Amr is responsible for all aspects of operation of the College of Engineering, with over 10,000 students, more than 300 professors, 400 staff, $240M total budget, $100M research expenditure, over $200M endowment, 12 departments, 2 institutes and 20 research centers. He is member of the Academic Leadership Council of Penn State and chairs the university Committee on Inclusive Penn State. During his time as dean, Amr initiated a one-year MS and MEng program comprising 16 degrees that are transforming the profile of the college. He has targeted biomedical and mechanical engineering for growth and secured 22 new faculty lines between the two departments. He has reorganized the Engineering fundraising group, office of finance, HR, and is in the process of modernizing Engineering IT. He created, with the heads, associate deans and directors, a strategy and an implementation plan, a five-year hiring plan for faculty, staff and development of infrastructure, a strategy for inclusiveness, created a communications office and an office of associate dean for research and innovation, global affairs office, and about to start an office for corporate research and philanthropy, and an office for data and assessment. He hired 31 professors in his first hiring season at Penn State, and is running 30 faculty searches this year. He also hired 2 associate deans, 3 department heads and a center director who is a member of the National Academy of Engineering. He was previously head of the Department of Civil and Environmental Engineering at the University of Illinois at Urbana-Champaign, USA and the Bill and Elaine Hall endowed professor. During his tenure as department head, research expenditure increased by 30% and graduate tuition income increased by more than 500%. He created three interdisciplinary majors, minors, MS and PhD programs that have attracted large percentages of students. The three interdisciplinary programs focus in ‘sustainable and resilient infrastructure’, ‘the nexus of water, energy and environment’ and ‘managing risk to society’. He was Director of the NSF multi-institution interdisciplinary Mid-America Earthquake Center (2004-2009). He was also Director of the NSF Network for Earthquake Engineering Simulations (NEES) Laboratory at Illinois (2002-2009). Amr obtained his Bachelor of Science degree from Cairo University, followed by MSc and PhD degrees from Imperial College, University of London. Before joining the University of Illinois in June 2001, Amr was Professor of Earthquake Engineering and Head of Division at Imperial College (1985-2001). He has been Visiting Professor at the University of Surrey, UK, since 1997. Other visiting professor appointments include the University of Tokyo, the University of Southern California, and the European School for Advanced Studies in Reduction of Seismic Risk, Italy. He is founder and editor-in-chief of the Journal of Earthquake Engineering (Taylor and Francis, SCI-expanded) and editorial board member of several other journals, a member of the drafting panel of the European design codes, past chair of the UK earthquake engineering association, UK delegate to and past senior Vice-President of the European Association of Earthquake Engineering and a member of the Council of the UK Institution of Structural Engineers. He serves the IStrcutE as ‘US Education Ambassador’. He is the winner of the Imperial College Unwin Prize for the best PhD thesis in Civil and Mechanical Engineering (1984), the Oscar Faber Medal for best paper in the Institution of Structural Engineers, and two best paper medals from the International Association of Tall Buildings, Los Angeles. Amr’s technical interests are multi-resolution distributed analytical simulations, network analysis under stress and disruption, large-scale fire ignition and spread modeling, hybrid testing and field investigations of the response of complex networks and structures to earthquakes. He has produced more than 250 research publications, comprising over 140 refereed journal papers and many conference papers, keynote and prestige lectures (including the Nathan Newmark Distinguished Lecture), research reports, 3 books and several book chapters, magazine articles and earthquake field investigation reports. Amr has supervised 45 Doctoral and over 100 Master of Science theses. Many of his students hold significant positions in industry, academia and government in over 14 countries. Verifiable analytical models for interacting soil and structure systems are still very challenging. While geotechnical software usually have limited capacity for structural analysis in the nonlinear range, the converse is true for structural analysis packages. In this paper, a multiple platform analytical model is developed and verified. The model is based on distributing the components of the system under investigation on a number of software packages, depending on the best and available platform. The components are run through a central coordination application, terms UI-SIMCOR, which sends force and displacement commands to the various different analysis programs, and obtains response data to be assembled appropriately. The process of dynamic analysis, using a step-by-step integration approach, continues in this closed-loop mode of sending force/deformation commands, and receiving resistance values until the dynamic loading episode is completed. The proposed multi-platform method is tested versus experiments on piles embedded in soil and the results are shown to be of very high quality. The approach eliminates the need of having one software analysis package with all needed features, since the best features of a number.